Commissioner: Chicago River flowed "down the 5000 block of North Monticello"
CHICAGO, Illinois (CNN) -- Chicago authorities asked Illinois Gov. Rod Blagojevich to issue a disaster declaration after rainfall Saturday in the Windy City broke a single-day record that had stood for more than two decades. Chicago received more than 6 inches of rain Saturday, breaking a 1987 record. The deluge flooded streets and stranded residents in their homes. 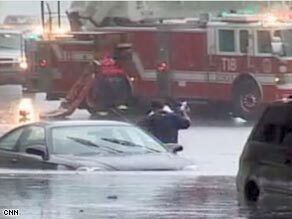 Officials worked to rescue people Sunday as the city grappled with another day of drenching. O'Hare International Airport recorded 6.64 inches of rain Saturday -- breaking the all-time record of 6.49 inches set in 1987, according to the National Weather Service. Records have been kept since 1871. By 4:30 a.m. CT on Sunday, emergency management and law enforcement officials were reporting widespread flooding across much of northern Illinois and extreme northwest Indiana, with rainfall totals of 4 to 7 inches in certain areas, the weather service said. In the worst-hit area, Albany Park, about 340 homes were in danger. About 40 residents were evacuated -- some of them by boat -- and taken to a shelter. About 90 billion gallons of water fell on the city's water district, authorities said. More than 20 water department crews were out, and widespread sandbagging operations were under way. Spatz said the city's sewer system was still "working well." City officials said that, in general, things were under control. Saturday's pounding rain was not related to Hurricane Ike. Remnants of Tropical Storm Lowell, which had come in from the Pacific, got caught up with a cold front, sending a wave of moisture into the region. But on Sunday, as the remnants of Ike -- by then a tropical depression -- worked their way farther into the country's heartland, heavy rain was expected over much of the region, including Illinois. On Sunday morning, the National Hurricane Center said flood and flash-flood watches were in effect for much of the state. But police reported no major incidents.